The wedding was very nice but it was a long day. We left at 9 this morning and arrived back home just a smidge before 10:45 p.m. 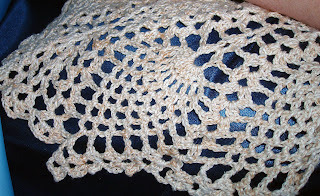 The shawl received several compliments - at least that's what Marie told me. She wore it during the wedding ceremony cause she was cold . . . . and somehow managed to hang on to it for the rest of the day. It's super soft and deliciously drapey. 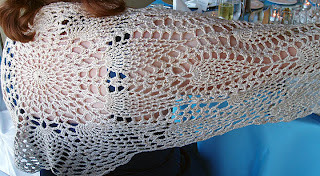 If I can pry it away from Marie, I think this is going to be one of my all-time favorite shawls. 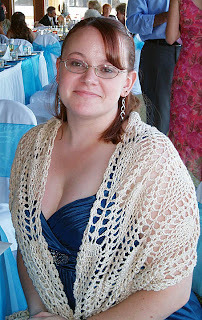 I am a huge pineapple fan and let me tell you, that shawl is stunning!